When I as growing up in the 1940s and '50s you could easily tell what part of the United States one came from by the way they spoke. I have wondered recently whether television, movies and the Internet have worked to make us all sound more alike? Are our regional dialects disappearing? In watching the series The Newsroom on television, one of my favorite shows, I am thinking our regional dialects are not disappearing so much. Or at least we have not lost the speed of our speech as experienced in the varying dialects. For example, I have trouble understanding what those wonderful people are saying on The Newsroom. They just talk too rapidly for me to keep up. Hey, I am from New Mexico where we like to savor our words a bit before we present them to the world! Obviously, on the East Coast, as in The Newsroom, their competitiveness is so great that they have to put their words out there as quickly as possible -- but for me it is like using a machine gun vs a little ole handgun. With this machine-gun speed, I cannot distinguish easily any nuances between the rat-tat-tat. Are Easterners afraid that if they speak too slowly someone else will claim their speaking time? Perhaps. 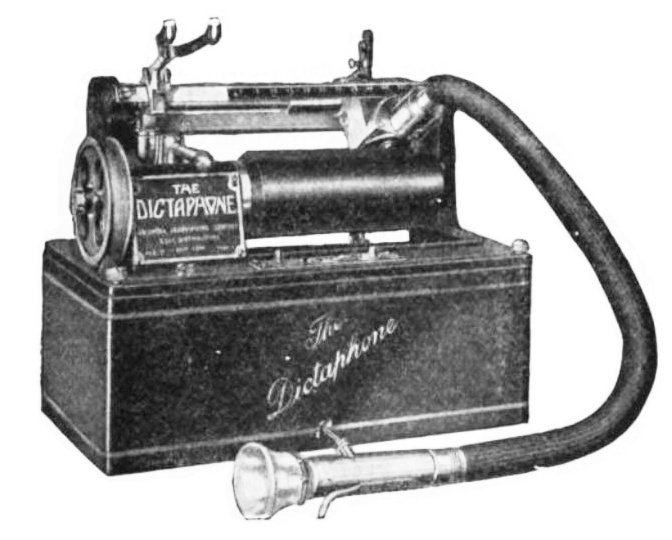 Dictaphone from 1920s. Photo is credited to the Columbia Phonograph Co. I once worked as a secretary for a man newly from Louisiana. I used a dictaphone, and he spoke his letters into a dictation machine for me to transcribe. This man spoke so very slowly, and here was such a long time between his words, I simply could not complete a single letter. Not one. This was before computers -- and I just kept putting periods where they should not be. Have you ever tried to erase a period? Periods in those days were pretty permanent. Plus, if you wanted to have copies, you had to type several pages at once. We did not have a copying machine. We used inked paper between pages, and it was extremely hard to make changes. No fun at all! So I assume Southerners just cannot stand to toss their words out there, potentially to lose them forever? They spoke ever so slowly, and ever so carefully back then. However, I have not traveled in years, so these days I do not normally hear dialects of people from other parts of the country. But I do see and hear politicians, and do not notice much of a language difference with them. Improved Communications Systems = Less Regional Dialects? Have our improved communications systems served as a melting pot for our regional dialects? Perhaps so. Many years ago when traveling with my family around rural Kentucky, we noticed many dilapidated small houses with very large TV antennas attached, almost overwhelming the small structures. This was in the 1950s. One has to assume that the popular TV shows influenced the growing populace that watched them -- making small but increasing inroads to their culture and their language. I will continue to watchThe Newsroom, but with lessened expectations. I no longer expect to understand every word, but will appreciate what I can understand. And, maybe someday, they will hire some actors with slower cadence in uttering their very smart scripts. And, by the way, I have been forced to speed up my cadence just so Californians do not get bored and tune me out. Also, I have stop addressing just about everyone as “you all” or y’all, but don't hold me to that if a Southern relative calls. Barbara Graham has enjoyed wonderful careers as a teacher, counselor, grants writer, fund raiser and nonprofit agency manager. These days, she creates jewelry and sun catchers using natural gems and Swarovski crystals, on display at HeavenlySuncatchers.